By admin | December 24, 2017. Christmas is coming which more importantly means the PDC World Darts Championship is imminent. 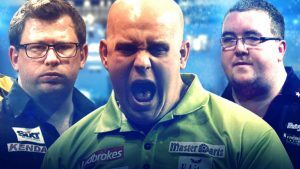 Reigning two-time PDC World Darts Champion Michael van Gerwen will begin the tournament as an odds on favourite despite the most open field in recent years. The Dutchman recently retained the Grand Slam of Darts in a run which featured a demolition of Phil Taylor in the semi-finals. The 2018 World Darts Championship will be a swansong for the record 16 time champion Taylor, who last won the championship in 2013. It isn’t unlikely that the greatest player the sport has ever seen could bow out with title number Seventeen, having achieved the World Matchplay for a sixteenth time back in July. Taylor is fourth favourite behind the Scottish duo of Gary Anderson and Peter Wright, with the former having lifted the trophy in two of the past three years. Anderson has been inconsistent in 2017 but comes alive on the Alexandra Palace stage having made the final of the tournament in each of the last three years. Peter Wright, a former runner up himself, enjoyed his first major success by winning the UK Open in March and has justified his place as third favourite for the Sid Waddell trophy by climbing to a career high number two in the PDC Order of Merit. 2017 has seen the emergence of new stars while some old ones have faded. Along with Peter Wright’s UK Open success, there have been two other maiden major champions crowned. Derryman Daryl Gurney has rocketed to fourth in the world with success at the World Grand Prix in Dublin while quirky Austrian Mensur Suljovic captured the Champions League of Darts. Both men are expected to make their Premier League debuts next season and should also be joined by Rob “Voltage” Cross, who has enjoyed one of the most successful debut years on the PDC circuit. Cross, who competed as an amateur last year, finished runner up in the European Championship while pushing MvG closer than anyone at the Grand Slam of Darts. ross has also suffered two final defeats on the European Tour to MvG but will still fancy his chances against the defending champion in the set play format, where timing and nerve are as crucial as anything. The former electrician finished the Players Championship Order of Merit as the top seed, ahead of MvG thanks to his four tournament victories. This incredible achievement is indicative of just how good Cross is. Seven-time Major champion James Wade and two-time World Champion Adrian Lewis should be avoided like the plague after enduring torrid seasons. Both players, despite their status and pedigree have had rhythm issues in 2017, with both failing to qualify for the European Championship while Lewis also failed to make the Grand Slam. Dave “Chizzy” Chisnall should also be overlooked having proven time and time again he doesn’t have the composure despite being a top eight regular since 2012. While Michael van Gerwen is deservedly tipped to win the championship, there is serious value in Rob Cross at 11/1. Gary Anderson himself can’t be overlooked at 11/2. Whatever way it turns out, there’ll be drama, upsets and three weeks of serious entertainment.